An admission ticket includes entrance to Balvenie Castle. An admission ticket includes entrance to Corgarff Castle. An admission ticket includes entrance to Dallas Dhu Historic Distillery and free audio tour available in English, French, German, Italian and Spanish. An admission ticket provides entrance to Duff House. Last entry is 30 minutes before closing. An admission ticket provides entrance to Elgin Cathedral. Tickets are valid all day from 9:30am. Last entry is 30 minutes before closing. Joint ticket with Spynie Palace available. An admission ticket includes entrance to Fort George and an audio tour available in seven languages: English, French, German, Italian, Spanish, Japanese and Gaelic. Tickets are valid all day from 9:30am. Last entry is 45 minutes before closing. An admission ticket includes entrance to Huntly Castle. Tickets are valid all day from 9:30am. Last entry is 30 minutes before closing. An admission ticket includes entrance to Kildrummy Castle. An admission ticket includes entrance to Spynie Palace. Joint ticket with Elgin Cathedral available. An admission ticket includes entrance to Tolquhon Castle. 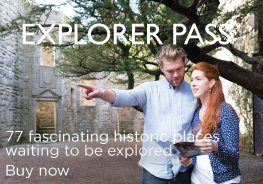 A joint admission ticket provides entrance to Elgin Cathedral & Spynie Palace. Tickets are valid all day from 9:30am. Last entry is 30 minutes before closing. Please note that you will receive one ticket per person when purchasing the Elgin-Spynie Joint Ticket.